Beloved dog-poet Max is back and he’s taking on Hollywood in this funny, jazzy tale, brought to life by Kalman’s bright illustrations. Enter Max. Dreamer. Poet. Dog. In this rollicking madcap tale, Max and his dazzling Dalmation bride take off to direct a movie in Hollywood. In Beloved Dog, Maira Kalman brings us the dogs in her life, as only she can, and the lessons they have for us all. From the dogs lovingly illustrated in her acclaimed children’s books to the real-life pets who inspire her still, Kalman’s Beloved Dog is a joyful and beautifully illustrated read and, as always, deeply philosophical. Filled with hundreds of gorgeous illustrations rendered uniquely in Kalman’s illimitable style, Beloved Dog is a tribute to the canines that fill our days. Who was Lincoln really? This little girl wants to find out. She discovers, among other things, that our sixteenth president was a man who believed in freedom for all; had a dog named Fido; loved Mozart, apples, and his wife’s vanilla cake; and kept his notes in his hat. 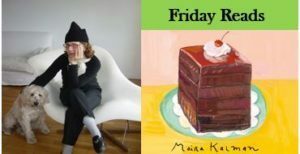 From his boyhood in a log cabin to his famous presidency and untimely death, Maira Kalman shares Lincoln’s remarkable life with young readers in a fresh and exciting way. The only style manual to ever appear on bestseller lists has explained to millions of readers the basic principles of plain English, and Maira Kalman’s fifty-seven exquisite illustrations give the revered work a jolt of new energy, making the learning experience more colorful and clear.